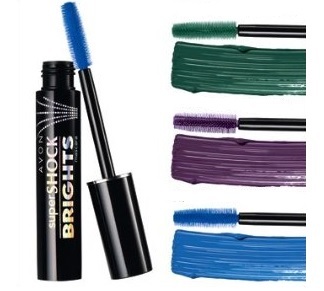 Avon SuperShock Brights Mascara - $9.99 - in 3 shocking, limited edition shades: Emerald Shock, Violet Shock and Royal Shock - with a lightweight, smudge and clump resistant formula. If the idea of coloured mascara scares you try the Violet Shock shade - it's very wearable, unless you looked really close you wouldn't even know it was a purple. If you're more adventurous and want to flaunt your coloured lashes, then Royal Shock is the way to go - if you don't want to be quite this blue just use it on the tips for a less dramatic look.